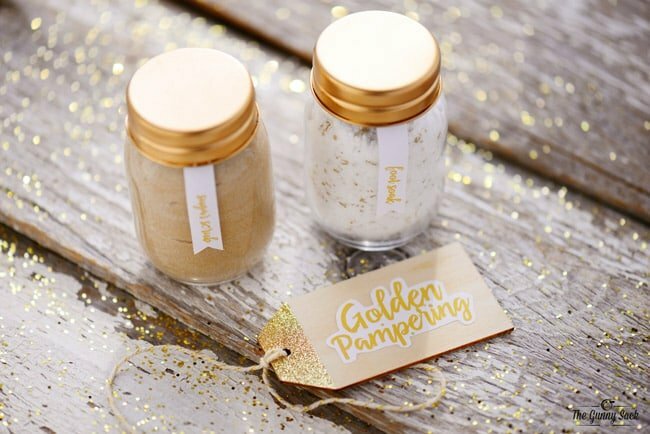 A Golden Pampering Mason Jar Gift has golden spa items. 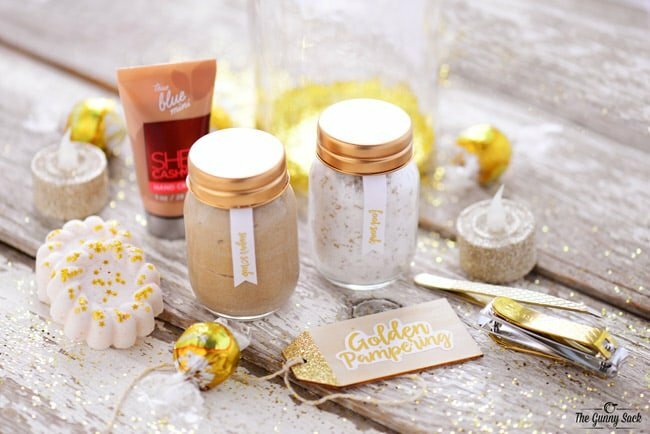 Post includes recipes for shimmering brown sugar scrub, gold dust foot soak and sparkling bath bombs. This gift in a jar is perfect for so many occasions! 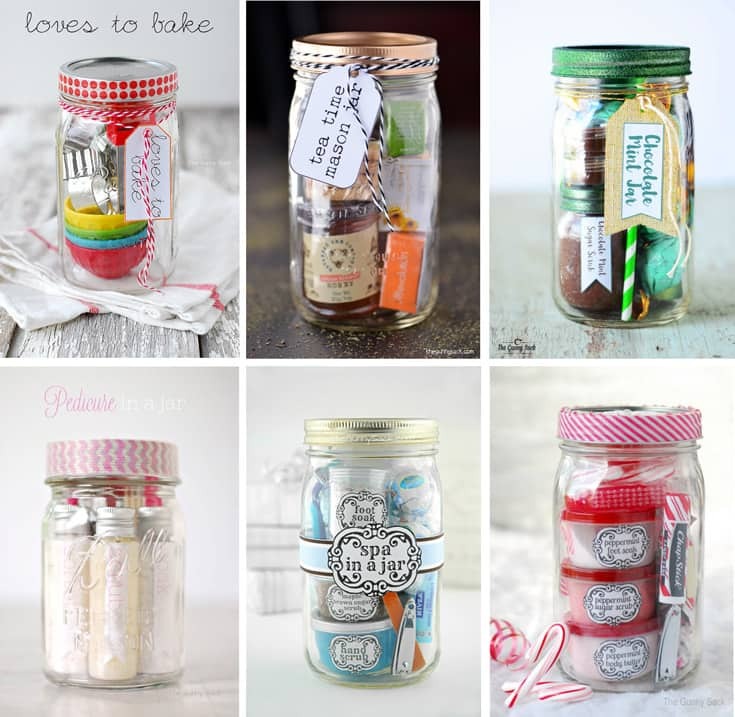 I have a long time tradition of sharing mason jar gifts and they have become extremely popular as a DIY Christmas gift. I shared the first gift in a jar during October 2011 and I’ve been sharing a few every year since then. So, this week I am taking a break from sharing recipes and will be showing you more mason jar gifts that you can make for the holidays. 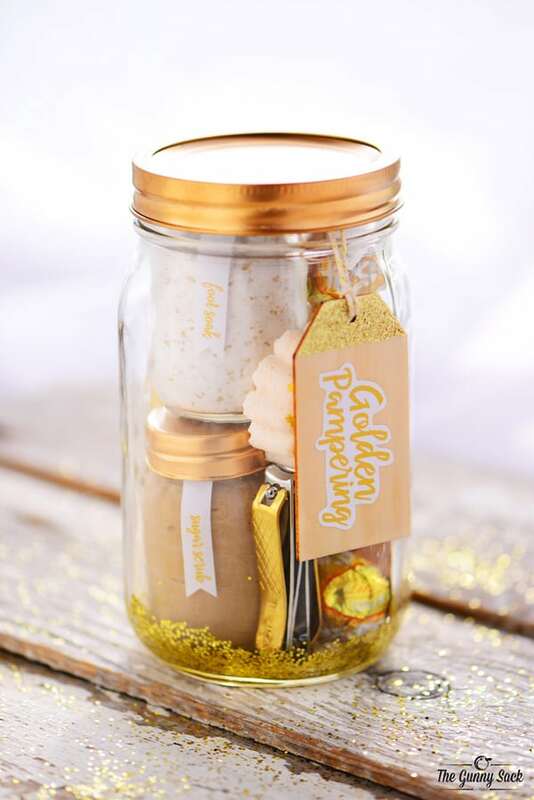 The first gift in a jar is the Golden Pampering Mason Jar Gift. It is can be given for any occasion or holiday from a bridal shower to a birthday party and Mother’s Day to Christmas. And you might want to make additional spa items to keep on hand for yourself when you need a day of relaxation. 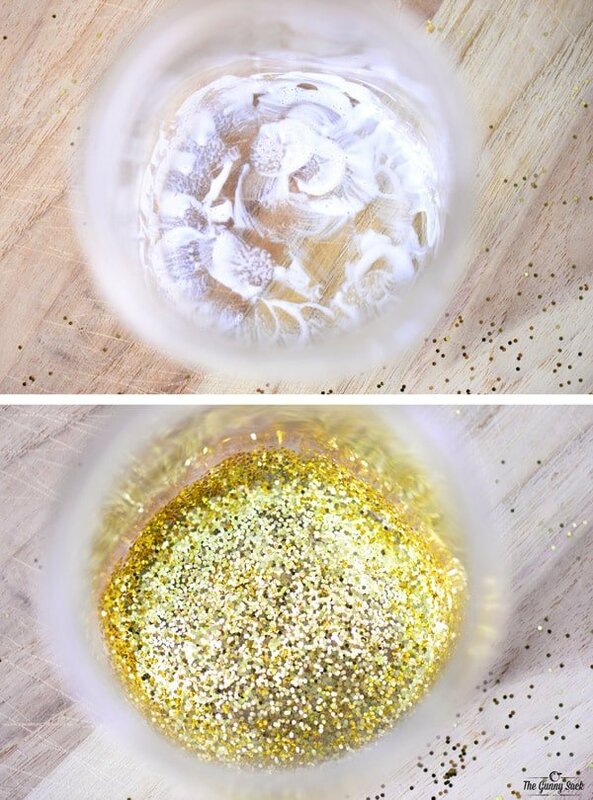 To prepare the Kerr quart size mason jar, spray paint the lid with metallic gold spray paint. 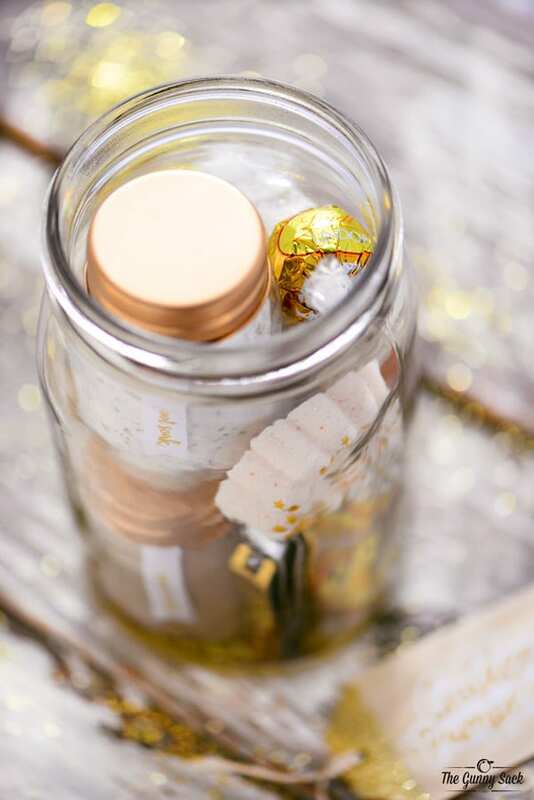 Then, paint the bottom of the jar and up the sides about half an inch, on the inside of the jar, with Mod Podge and sprinkle with gold glitter. Melt the coconut oil in the microwave. Stir in fragrance oil and water. The amount of water needed will depend on the humidity of your house. 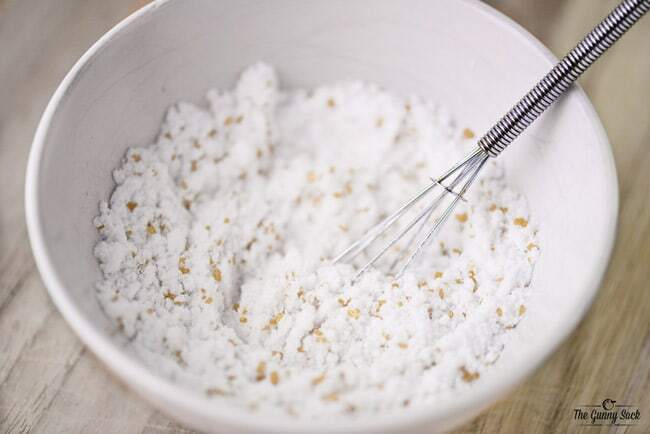 Pour the coconut oil mixture over the dry ingredients and stir with a whisk. The mixture should start clumping on the whisk. Sprinkle some edible glitter stars on the bottom of four molds. I used vintage fluted metal molds from a thrift store. 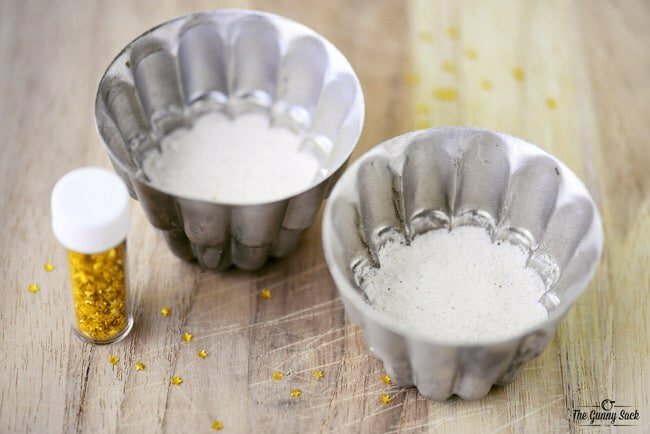 Spoon three tablespoons of the bath bomb mixture into each of the molds and pack it in with your fingers until you can’t pack any more in. Turn the mold upside down over a piece of waxed paper to remove the bath bomb. Gently tap the mold or tap on the sides of the mold with a metal spoon until the bath bomb slides out. 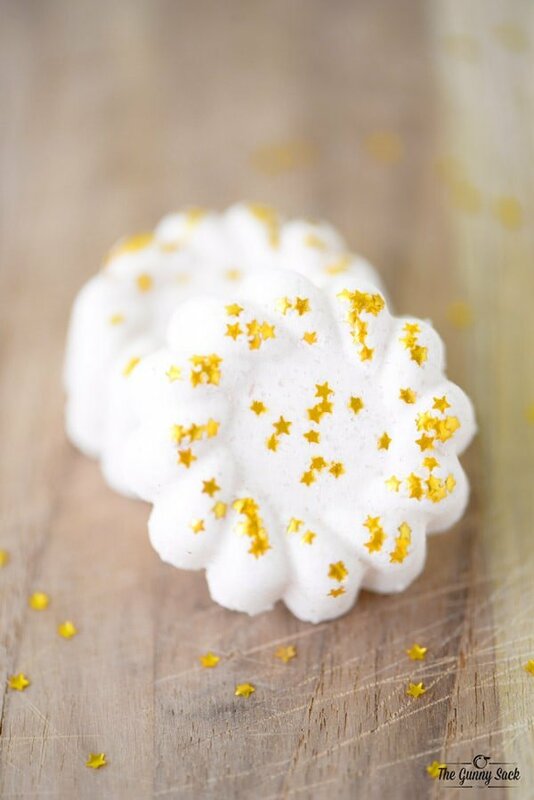 The gold stars will stick to the bath bombs and dissolve when used. 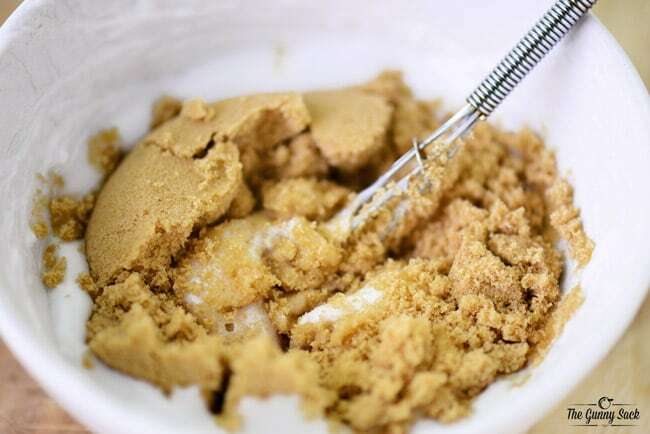 Whisk together the baking soda, epsom salt, sprinkles, and brown sugar fragrance oil. Whisk together the coconut oil and sweet almond oil. Stir in fragrance oil, if desired. 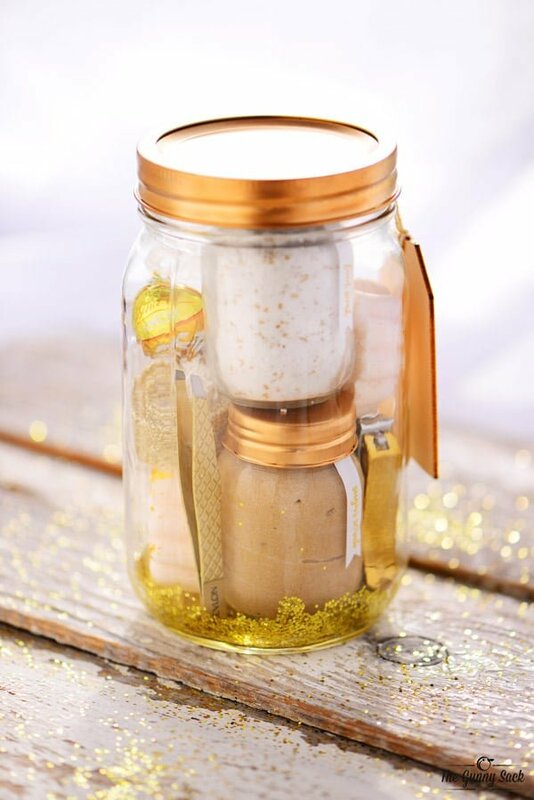 Put the sugar scrub and foot soak into small mason jars with gold spray painted lids. Print out the labels (you can download my labels here), cut into strips and glue onto jars. Cut out the Golden Pampering label and glue it onto a wooden gift tag. The ones I used were from the Dollar Spot at Target. They are no longer available but you can buy wood gift tags and add gold glitter to the top with Mod Podge. Slowly put everything into the mason jar. It might take a little rearranging to get everything to fit. I stacked the two small mason jars on top of one another. 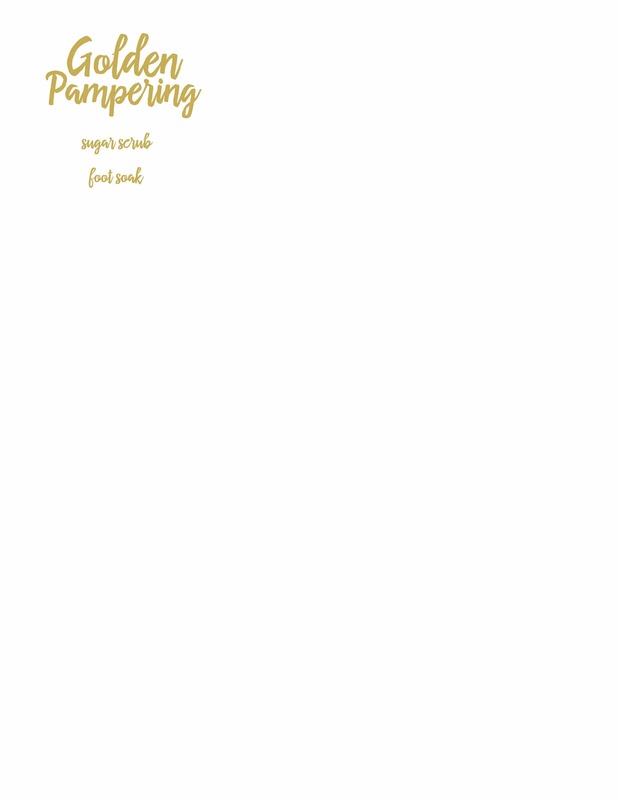 Tie the Golden Pampering label onto the jar and the jar is ready to give to someone as a gift. 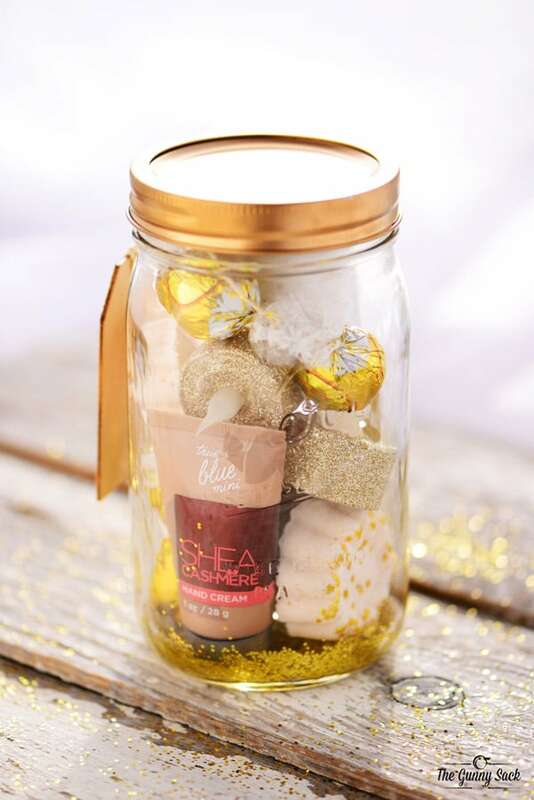 This Golden Pampering Mason Jar is so much fun that you just might want to keep it for yourself! Thank you so much for sharing, The gifts in a jar are great gifts and so easy to make also everything used all natural. This is so cute I love it! !